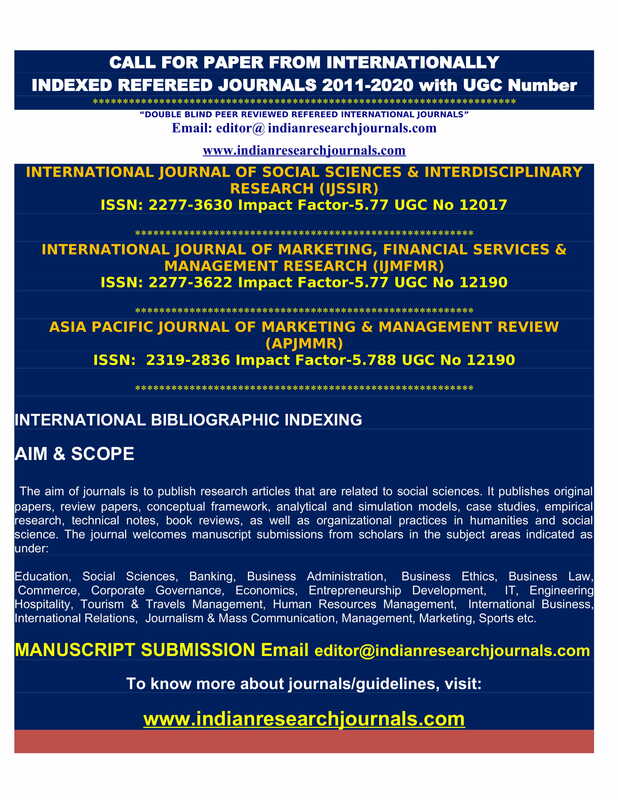 Research Articles invited for IJSSIR, IJFMSMR ( October-December. 2017, Print Issue), to be released on 28th December, 2017. The submitted manuscript must not have been previously accepted for publication or under review elsewhere. Each manuscript will be primarily examined by the editor, and then forwarded to two referees for blind review. The research paper shall be published subject to recommendation of referees. The review process may take up to two months. The Editor relies upon the evaluation reports provided by the reviewers, the originality and relevance of the ideas addressed in the article and the possible contribution to the journal in deciding whether to accept the manuscript for publication. The author’s shall be informed about the selection of the article/paper by e-mail only. Indian Research journals Welcomes you to conatct us for publising conference papers.